This portable collection of handy tools will keep your life in good repair. I had read extensive reviews of UncommonGoods products, customer service, etc. prior to purchasing this item, and I wasn't entirely sure what to expect as the reviews were only moderate. When my item arrived earlier than it was supposed to, I was pleasantly surprised with the quality of the material and the speed of delivery. 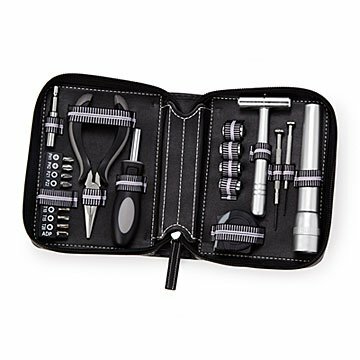 The "Fix It Kit" is good quality and made a great gift. I would definitely recommend! My son has already used this to make repairs and open that pesky packaging that requires a sacrifice to the gods. I'm so glad I saw this as it will be perfect for him to keep in his car or his dorm room. He's used it to repair a tail light on his van! My son's 22-year-old girlfriend replaced the fan belt on her car. I thought it was time for her to have her own set of tools. This gift was perfect! I especially liked that it was offered in black and pink. This was a great gift for our daughter who is in her first apartment as a starter tool set. Contains just the basics, but very cute in the pink and seems to be well-made. Absolute quality and excellent with a case that is lovely. All in one type of easy to zip open and presto, the tools within grasp. A professional case and a total perfect gift of functionality. Have used many times . Very handy and convenient. Great to have some many essentials in one place. Also would be a great gift for a college student going away. I bought several of these kits for stocking stuffers and one for a male colleague who just received a promotion. I always find it hard to find gifts for men, Uncommon Goods helps me out often! They were gifts, For them to use however the whished,!!!!!!!!!!!!!!!!!!!!!!!!! I AM going to buy more of these later,!!!!!!!!!!! Unlimited uses, for many , many, things, and Items!!!!!!! !